There are two possible ways to send event messages through game objects on Unity3D: 1 – Send messages to linked objects; 2 – Search for objects on scene, and execute components functions. First, let’s see the how to send messagens to linked objects, using Send Message, BroadcastMessage, and SendMessageUpwards. Attention: Use cube elements as shown in the image, use the same names. The fountain, and cannon objects, must have a EllipsoidParticleEmitter, a ParticleRender and a ParticleAnimator, set them as you want. Attention 2.: In object Cube2, add the BasicInputHandler script, we explored in User Input tutorial. The method SendMessage will execute a certain function, in any object componen which has the function. Preparation: In fountain object, set it’s BoxCollider Component as a trigger. Create these two scripts, and drag them to the fountain gameObject. The SendSimpleMessageScript will detect collisions, and send the message “TurnFountainOn”, along with the boolean value true or false. the FountainScript, has the function TurnFountainOn, which will turn the particles on, according the argument recieved:true or false. The Method BroadcastMessage will do the same job as SendMessage, but with the possibility to send the message to other game object, as far as they are perental linked, the messages are send to the sender’s children objects. Preparation: Make the cannon object, child of cannonPlat object (use the panel for that). Make the FountainScript component of cannon object. Set the cannonPlat’s BoxCollider as trigger. As soon as the SendSimpleMessageScript detect collisons, it broadcasts the message TurnFountainOn, to all it’s children objects, and the ones who have the TurnFountaiOn function, can perform actions. 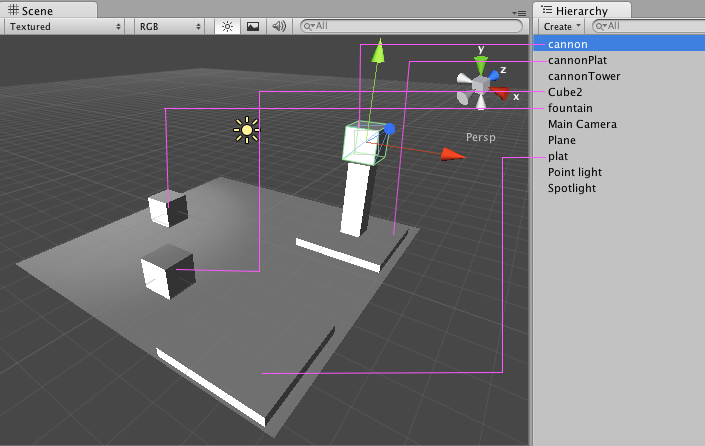 Any gameObject on Unity3D can execute the function Find, that will search for gameObjects over the scene. From this search, it´s possible to call for functions on the gameObject found. Preparation: Set the plat’s BoxCollider as a trigger. Make the FountainScript a component of cannon object. Make the FindBehaviorScript, component of plat object. Just like the previous scripts, this script will detect collisions, and than search for the cannon and fountain objects. When the object is located, we can access it’s components, and execute their functions. See the docs for this procedures. Take aa look to the final sample.